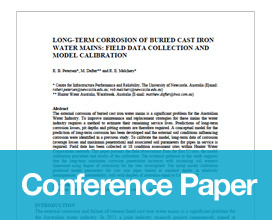 The external corrosion of buried cast iron water mains is a significant problem for the Australian Water Industry. To improve maintenance and replacement strategies for these mains the water industry requires a method to estimate their remaining service lives. Predictions of long-term corrosion losses, pit depths and pitting extents are therefore required. A conceptual model for the prediction of long-term corrosion has been developed and the external soil conditions influencing corrosion were identified in a previous study. To calibrate the model, long-term data of corrosion (average losses and maximum penetration) and associated soil parameters for pipes in service is required. Field data has been collected at 18 condition assessment sites within Hunter Water Corporations network. This paper presents the field observations from the first 11 sites, the model calibration procedure and results of the calibration. The evidence gathered in this work suggests that the long-term maximum corrosion penetration increases with increasing soil wetness (measured using degree of saturation) for the sites investigated. The initial model calibration produced model parameters for cast iron pipes buried at standard depths in relatively homogeneous, low-permeability, soils with degrees of saturation equal to 0.66 and 0.76.